In a quiet, dark room, lit only by yellow candlelight, your fingers close around the knife handle. You’re terrified. It’s been a year since you’ve plunged a sharp knife into such thick, dry skin, and yet, as you near your victim, the sensation feels familiar. Your confidence grows, because you’ve done this before. You chop off the head. You reach inside the carcass. In up to your elbow, you grasp the slimy innards and pull—pull—pull until the stomach contents are strewn about your kitchen table. Then, you carve a face into the monster, and it looks back at you, eyes ablaze, open mouth screaming in silence. I’m talking about pumpkin carving. Obviously. A little history about our so-called “Jack O’Lanterns.” The original story comes from Ireland. There was this town drunk, known as Stingy Jack. He liked to play tricks and cause general mischief, until one day, he played a trick on the Devil. Big mistake, dude, but because of his trick, Jack made the Devil promise never to take his soul. Eventually, Stingy Jack died. When he went to Heaven, St. Peter told him he wasn’t a good enough person to enter the pearly gates. So Jack went down to Hell, but the Devil refused to take his soul because of the promise he had once made. On his way out of Hell, the Devil tossed Stingy Jack an ember to light his eternity on earth. Jack put the ember in a hollowed-out turnip, destined to wander the earth, alone and forlorn, forever. So to this day, on All Hallow’s Eve (Halloween) in Ireland, people carve vegetables and place candles inside to keep Stingy Jack away. In the 1800s, Irish immigrants brought the tradition to America, where they discovered pumpkins, which were much bigger and easier to carve. Hence the Jack O’Lantern. Me and Jake's pumpkin! Spooky! I will freely admit that I’m terrible at pumpkin carving. I do it because it’s fun, not because I think I’m good at it. As I’ve mentioned before, on Sullivan’s Island in South Carolina, there is an annual pumpkin carving contest at Poe’s Tavern (named for spook king, Edgar Allan Poe, who served at Fort Moultrie on the island). I would go to Poe’s with two of my gal pals, Becky and Mary, who had grown up on Sullivan’s. They would usually win the contest, which meant our bar tab was paid for. And no, I didn’t just go because my bar tab ended up FREE. I went because it was marvelous to see other people’s pumpkin skills. Mary and Becky were among the best. But by the end of the night, there were dozens of close contenders, all lined up and glowing on the entrance steps to the tavern. There’s just something eerie about Jack O’Lanterns, especially if you think about the Irish folklore. I do love the process, but I more so love the end result: the orange, glowing monster on my kitchen table, protecting my house from evil spirits and Stingy Jack. Don’t you love the way the pumpkin smiles its secret smile? Don’t you love the way the pumpkin smells with the candle slowly roasting inside? Don’t you freakin’ love Halloween? Our time together in Halloween Town has almost come to an end. Only one more post in this glorious month of revelry, folklore, and honoring the dead. I hope you’ve enjoyed the ride. 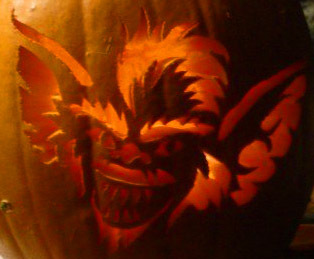 And don’t forget to light your Jack O’Lantern, or Stingy Jack might pay you a visit on All Hallow’s Eve. One of Mary's pumpkins. Amazing. Great post. Wild story about the Jack O’Lantern. Mary’s carving is amazing. I had never heard the history of pumpkin carving before. SO interesting! I only carve because I love frying and eating the seeds 🙂 But kudos to those with artistic carving talent! My son was looking for a scary Halloween story and your blog post did just the trick. I just cut open our family pumpkin and we had so much fun digging in. I also teach nursery school, and some of my little students played around with the innards until thier little hands were as orange as an oompa loompa from Charlie and the Chocolate Factory. We also had fun roasting the seeds. I add salt and hebs de Provonce to mine. Happy Halloween. I made the seeds last night. Added garlic powder and Worcestershire sauce. They were delicious! Haha, love the way you start! Interesting background, I didn’t know there was a story behind it. Wow, this is a great post! I love you how gruesomely describe a pumpkin being gutted! And the history behind pumpkin carving is so cool! Mary’s carving is also AMAZING! All I manage to do is cut out some eyes, a nose, and a mouth with fangs. Congrats on getting Freshly Pressed–well earned! I had never heard the history of pumpkin carving before, too. Great post. I didn’t either!! This Halloween Town series has been so fun. I’ve learned a ton, all about my favorite holiday!! Congrats on being Freshly Pressed! Mary’s Pumpkin in Great! Mine is similar to yours but I do love doing them so! I even put eyelashes on them! Eyelashes?? You must be pretty good to do eyelashes!!! There is such an art form to pumpkin carving. Sadly, I’m not proficient. Such an interesting story and a creepy one! I thought you were doing something horrible, but it was just pumpkin carving, hehehe. I find Mary’s pumpkin awesome and yours is indeed spooky! Congratulations for being freshly pressed! i love how america handles halloween. i wish i was able to be there at this time of year. britain is so boring. great post!! and the cravings are amazing!! real talent! I wish I could say the Gremlin one was my own. I received images of Mary and Becky’s carvings from this year last night. Mary actually carved the word “Nevermore” into a pumpkin with a picture of a raven beneath it. I mean … seriously??! Insane talent. Wow , this is great !! The history behind pumpkin carving is very interesting and the carving’s themselves are unique! thanks for the origin of the jack o lantern. i didn’t know that 🙂 great post, btw. happy halloween! I love the beginning to your post. How you’re not quite sure what you are reading is what you think you’re reading. Very interesting post. Now, I have to go back and read your other October posts to see what else you may have written that can delight my little Halloween loving soul. I’m totally obsessed with Halloween, so I dedicated the entire month of October to the holiday. Usually, I’m so busy with “life,” I miss most of the fun. Not this year. Uh-uh. I’ve watched a dozen horror movies already. I love this time of year!!! Oh the sights, the sounds, the smells … the slimy innards of pumpkin carving! Great job! And congrats on being Freshly Pressed! You’re definitely right about the awesome smell of the candle roasting the pumpkin from the inside! Your post makes me want to make a jack-o-lantern now. I’m so glad we don’t carve turnips any more. Somehow I think jack-o-lanterns would be much less popular if that were still the case. 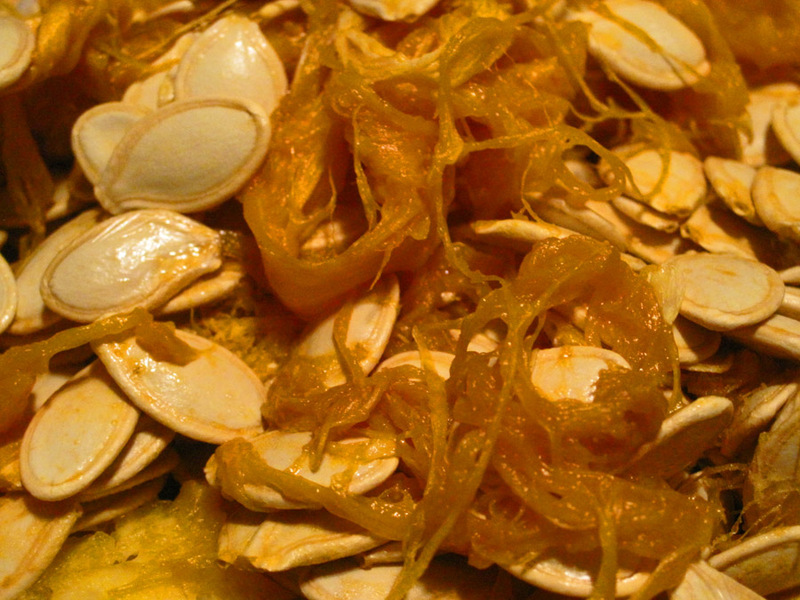 Eww…pumpkin guts. I can’t hang. I haven’t careved a pumpkin for decades. My skin crawls just thinking about it. Hahaha … well, then you have somebody else pull out the innards. You do the carving! I will never understand how some people create such amazing art. I am incapable of using a pen on paper to make something that creative let alone using a psycho blade on vegetables. Thanks for a very entertaining and educational post. I had never heard this story before. May you have a great Halloween! 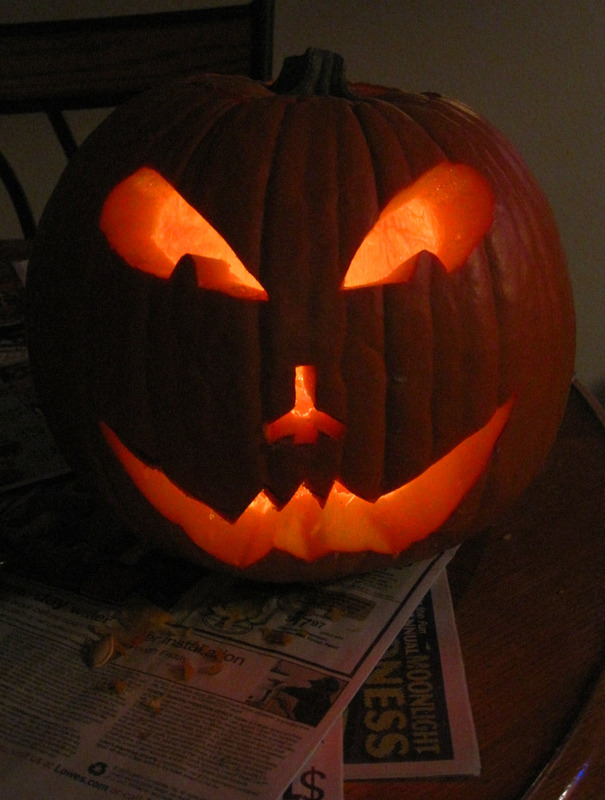 I tried to carve a turnip for Halloween once in honor of the history of the Irish…….a bit challenging, though nice. The pumpkin is definitely the better choice. Please tell me how you roast your pumpkin seeds? How long do you allow them to dry before putting them in the oven? Mine always burn. Happy Halloween! I bet it’s beautiful in Washington this time of year 🙂 Have fun! I love the falli-ness smell of a carved pumpkin. That last one looks exactly like Spike from “Gremlins”! I never knew the history of the Jack O’ Lantern. So interesting, thanks for posting this. The pics of the carved ones are works of art! I like taking the seeds and growing my own for the next year! Nothing like growing your own pumpkins! I’m a traditionalist. I like the old stand by face-triangle eyes and nose, the smile with one tooth on top, two on the bottom. I know, I’m boring. If I had a garden, I would love to do that!!! And you’re not boring. You’re like me. Traditional. And, at least in my case, not very artistically inclined 🙂 Happy Halloween!!!!!! It is very interesting to us Australians who don’t know the reasons for the Hallooween traditions. I haven’t carved a pumpin since I was in high school…Sara Dobie, you may have just inspired me 18 years later. Great post! 🙂 Boo! Ha! I’m so happy to hear it 🙂 Now get carving! Halloween is tomorrow!!! This is really good. I like how it starts!! I thought your build up in the first couple paragraphs was very clever. I can’t wait to read more. As this Halloween tradition is somehow new where I live, this Jack O’Lanterns it’s so interesting to me! I have heard of this character before, but never knew is story. Thanks you sharing! LOVE it! I just carved pumpkins with my kids. Now I’m not that good, but I still love putting my hands in there and feeling the gooey inside! Hi Sara, we got Freshly Pressed on the same day and I wanted to say Congrats and hope you enjoyed the crazy ride the past couple of days. Oh yeah, and sweet post. I am a Halloween nut myself and spend another pre-Halloween Saturday elbow deep in the “innards”. Thanks for the story sharing. Un petit coucou de Brocéliande ! Bonne Samain et Bonne année ! Elle sont très belles tes citrouilles. Bisous tendresse à toi ! See! History CAN be fun! Thanks for the info. This was a great blog. I really enjoyed the beginning of it because I almost felt like I was inside a horror novel waiting to see what happens next. I never knew the history of the carving a pumpkin. It was a well-said story and I found it to be very interesting. I would have never guessed that it all started in Ireland. Too bad for Jack because now that everyone carves a pumpkin it has become such a well-known Halloween tradition. Good to know the legened behind the tradition. Fall as a whole has so many traditions associated with it. Is it wrong that the title only made me think about Dexter? Heck, no! I love Dexter. I take that as a compliment. Nice to read about the legend and cool carving !! saradobie: Cool! Sorry it took me so long to answer your post but I’ve gotten sidetracked.